WEST FARGO – Austin Arneson picked up his fifth win of the season Friday night at Red River Valley Speedway. 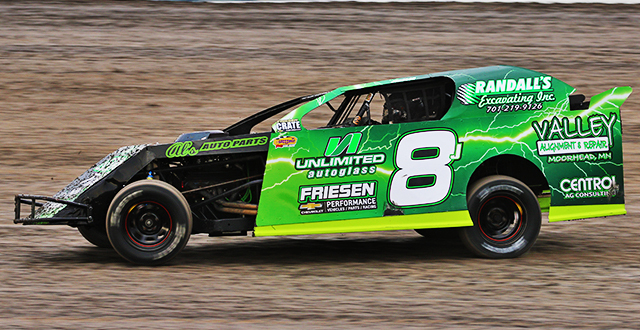 Arneson has now won five of the first six IMCA Modified features at the West Fargo dirt track. The only race he hasn’t won came on May 25th, where he crossed the finish line first, but was disqualified following the race for his car weighing in too light. Jason Strand took the early lead of the modified feature from the third starting position. Strand paced the field in his No. E85 machine until defending track champion, Rob VanMil, took the top spot on lap six. 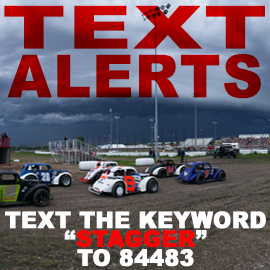 Strand battled back with 15 circuits remaining and briefly took the lead down the back straightaway. VanMil was too strong, however, and pulled away from Strand using the high lane. With Arneson starting 11th, it took him several laps to make his way up to the front, but once he did he made his presence known. 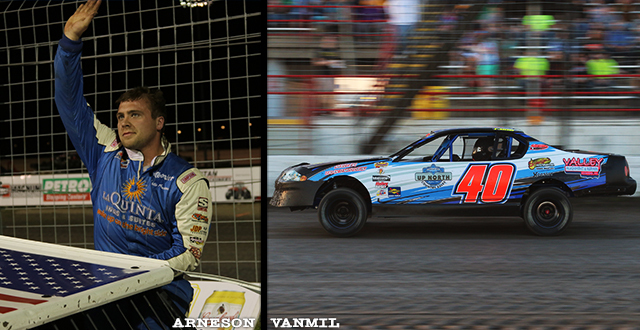 Arneson took second at the halfway point before challenging VanMil for the lead with under five laps remaining. The two veteran drivers were side by side for the lead when they made contact on the front straightaway, which sent VanMil spinning uncontrollably into the infield. Race officials charged VanMil with the caution, which sent him to the back of the pack. Arneson held off Dave Shipley and Strand in the final laps to take the win. 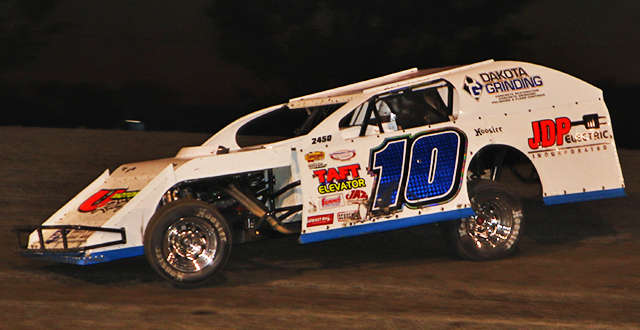 The IMCA Sport Mod feature began with Taylor Grove taking the early lead after starting in the fourth position. 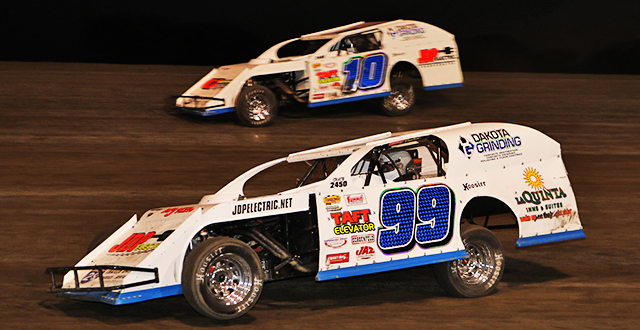 The Shelly, Minn. driver held a comfortable lead over Luke Johnson before the yellow flag waved with 10 laps to go. On the restart, Johnson took the point after a four-wide battle for the lead with Grove, Chris VanMil, and Jesse Skalicky. In what looked to be a replay of last week’s feature, Johnson had his hands full with Skalicky as they raced for the lead in the closing stages. After battling side by side for four trips around the three-eighths mile dirt oval, Skalicky grabbed the lead with seven laps to go and went on to claim his fifth win of the season. Duffy Froemke picked up the IMCA stock car feature win in dramatic fashion. The Lisbon driver stalked Rick Schulz for the duration of the 15-lap feature before stealing the win on the last corner of the final lap. Froemke dove to the inside of Schulz entering turn three and slid up right in front of Schulz exiting turn four to win the race back to the checkered flag. The win was Froemke’s fourth of the year. Hillsboro’s Brandon Schmidt executed a dominating performance in the IMCA hobby stock feature. Tim Estenson grabbed the INEX Legends feature win from the fourth starting position. The win marks Estenson’s fifth win of the young 2017 season. Feature – 1. Austin Arneson, Fargo, N.D.; 2. Dave Shipley, Fargo, N.D.; 3. Jason Strand, Portland, N.D.; 4. Jarrett Carter, Lisbon, N.D.; 5. Dale Kraling, Mayville, N.D. Feature – 1. Jesse Skalicky, Fargo, N.D.; 2. Luke Johnson, Moorhead, Minn.; 3. Kelly Jacobson, Fargo, N.D.; 4. Chris VanMil, Barnesville, Minn.; 5. Taylor Grove, Shelly, Minn. Feature – 1. Duffy Froemke, Lisbon, N.D.; 2. Rick Schulz, Horace, N.D.; 3. Tim Compson, Valley City, N.D.; 4. Kelly Jacobson, Fargo, N.D.; 5. John Sandvig, West Fargo, N.D. Feature – 1. Tim Estenson, Fargo, N.D.; 2. Donavin Wiest, Wishek, N.D.; 3. Andrew Jochim, Glyndon, Minn.; 4. Baiden Heskett, Shakopee, Minn.; 5. Kaitlyn Skalicky, Fargo, N.D. Feature – 1. Brandon Schmidt, Hillsboro, N.D.; 2. Tim Shiek, Fargo, N.D.; 3. Tim Church, Moorhead, Minn.; 4. Torey Fischer, West Fargo, N.D.; 5. Eric Novacek, West Fargo, N.D. In the World of Outlaws Craftsman Sprint Car Series last visit to Red River Valley Speedway in 2012, three-time series champion and Hall of Famer Sammy Swindell was victorious. Swindell started on the pole and led early before Chad Kemenah took the top spot on lap-9. Swindell would re-take the lead with eight laps remaining to earn his seventh A-Feature win at the track. Donny Schatz, who calls Fargo home, has won four times at his home track, including winning both nights of the 2006 “Duel in the Dakotas.” The eight-time and defending series champion has 26 top-10 finishes in World of Outlaws Craftsman Sprint Car Series competition at Red River Valley Speedway. Schatz raced with the Outlaws for the first time at the track as a teenager in 1993, finishing 15th. Joey Saldana, who is currently ninth in points, has three wins at Red River Valley Speedway in his career, with the most recent of those coming in 2004. The veteran driver has finished seventh or better in each of his last six starts at the track. Daryn Pittman, the 2013 World of Outlaws Craftsman Sprint Car Series champion, won in his last start at Red River Valley Speedway in 2008. Jason Sides has five straight top-10 finishes at Red River Valley Speedway, dating back to 2005. The veteran driver has made 19 starts in his career with the World of Outlaws Craftsman Sprint Car Series at the now-three-eighths-mile, which was a half-mile for many years. Shane Stewart and Paul McMahan have similar resumes at Red River Valley Speedway. McMahan has made 18 starts and has seven top-10 finishes, while Stewart has taken the green flag 16 times and recorded five top-10 runs. Kraig Kinser has eight top-10 finishes in 12 starts at the track in his career, including a third-place run in 2005. Greg Wilson, the reigning Kevin Gobrecht Rookie of the Year Award winner, has made a pair of starts at Red River Valley Speedway, with those coming in 2006. Exactly half of the 16 drivers competing full-time with the World of Outlaws Craftsman Sprint Car Series in 2017 will be making their first visit to Red River Valley Speedway. David Gravel, Brad Sweet, Jason Johnson, Logan Schuchart, Jacob Allen, Clyde Knipp, as well as rookie contenders Sheldon Haudenschild and Brent Marks will all be getting their first glimpse at the track. 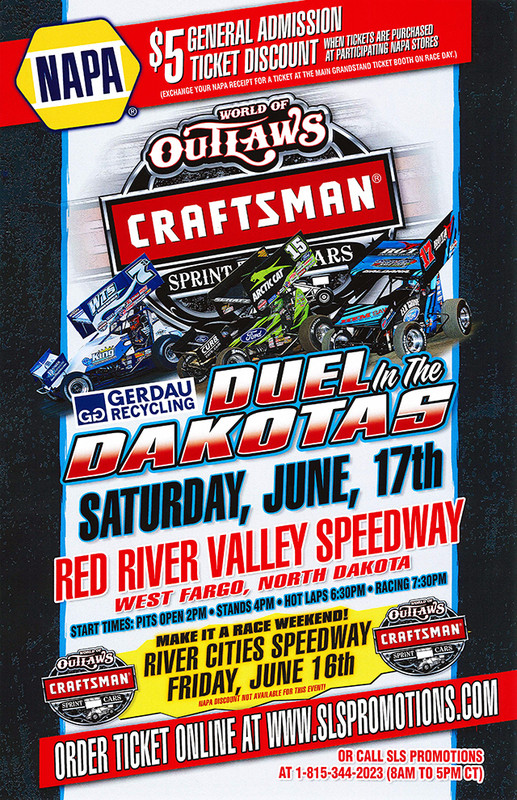 WEST FARGO, N.D. — June 2, 2017 — Discount General Admission tickets for the Gerdau Recycling Duel in the Dakotas, featuring the World of Outlaws Craftsman Sprint Car Series at Red River Valley Speedway in West Fargo, N.D., on Saturday, June 17 are now available for purchase at participating NAPA Auto Parts stores. 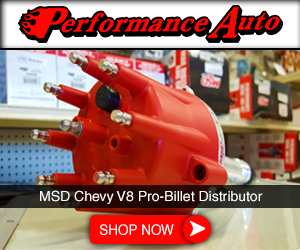 Each General Admission ticket purchased at a NAPA Auto Parts location will feature a special $5 discount. Tickets buyers will exchange their NAPA receipt for tickets at the Main Grandstand ticket booth on race day. 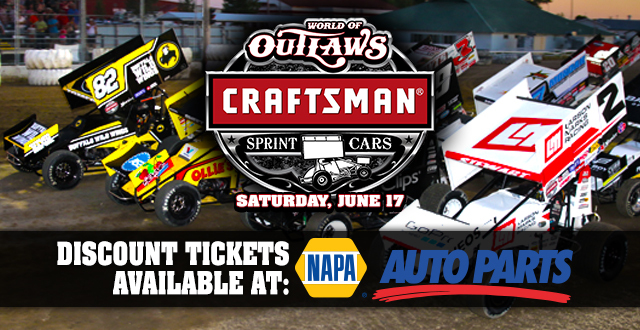 With the NAPA Auto Parts $5 discount, Adult General Admission tickets purchased at participating stores are $32, while Child General Admission (6-12-years-old) are $12. Children ages five-under will be admitted free in the General Admission seating section. Additional information for the Gerdau Recycling Duel in the Dakotas at Red River Valley Speedway in West Fargo, N.D., on Saturday, June 17 can be found at https://slspromotions.ticketforce.com. Reserved seats can also be purchased online and by calling 815-344-2023. WEST FARGO – With threatening skies off to the west, it was an accelerated night at Red River Valley Speedway Friday evening as the track hustled to beat the weather. 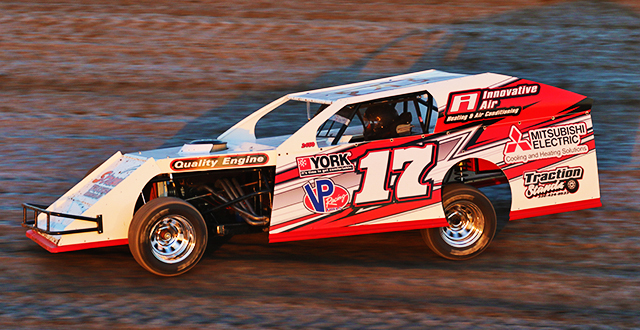 Luke Johnson picked up his first win of the season in the IMCA Sport Mods. The Moorhead driver was charged for a debris caution in the opening laps, which put him to the tail of the 17 car field. Within a matter of laps, Johnson had made his way back up to second, but he had defending track champion, Jesse Skalicky, in his way. Johnson took advantage of a late-race caution as he used the low side of the speedway to reel in Skalicky. It came down to a drag race to the checkers, where Johnson edged out Skalicky by a half car length. “There was a real small tack strip around the bottom, and if you entered the corner real slow and hit it, you could carry a lot of speed out of the corner,” said Johnson in KRJB victory lane. Fargo’s Austin Arneson continued his winning ways after picking up his third win at the West Fargo three-eighths mile dirt oval. After four and even five wide racing early on, Rob VanMil paced the field of 22 cars in the early going. On lap seven, Arneson, who started in 11th, came up to challenge the Barnesville, Minn. wheelman for the race lead. Arneson successfully maneuvered by the No. 4D of VanMil before cruising out to a five and one-half second lead. Arneson backed up his win Thursday night at Norman County Raceway in Ada, Minn. as he went on to score the victory over Jarrett Carter, who started 13th. Rick Schulz picked up the IMCA Stock Car feature win. The Horace driver has scored countless victories in the WISSOTA street stock class over the years at the speedway but held off Lisbon’s Duffy Froemke for his first win in the brand new stock car division. Sean Johnson was victorious in the INEX Legends, while Tim Shiek won the IMCA hobby stock feature. 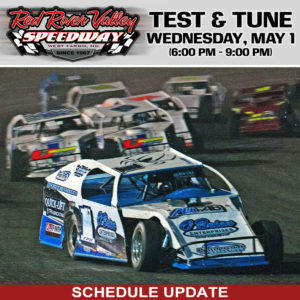 Racing continues next Friday night at Red River Valley Speedway with ‘Meet N Greet’ night, where all fans can get an up-close look at the cars and visit with their favorite drivers during intermission. 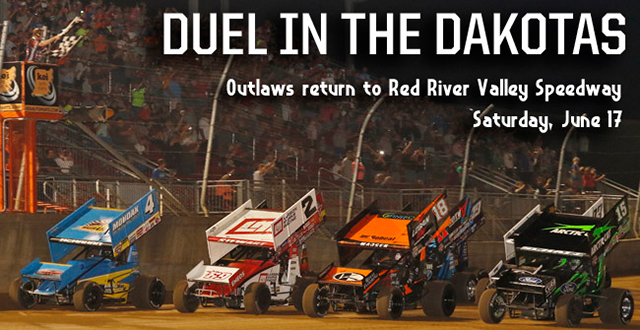 On June 17th the World of Outlaws Sprint Cars make their highly anticipated return to West Fargo. Feature – 1. Austin Arneson, Fargo, N.D.; 2. Jarrett Carter, Lisbon, N.D.; 3. Dave Shipley, Argusville, N.D.; 4. Rich Pavlicek, Casselton, N.D.; 5. Rob VanMil, Barnesville, Minn. Feature – 1. Luke Johnson, Moorhead, Minn.; 2. Jesse Skalicky, Fargo, N.D.; 3. Matt Talley, Sabin, Minn.; 4. Chris VanMil, Barnesville, Minn.; 5. Kelly Jacobson, Fargo, N.D. Feature – 1. Rick Schulz, Horace, N.D.; 2. Duffy Froemke, Lisbon, N.D.; 3. Kelly Jacobson, Fargo, N.D.; 4. Randy Klein, Lisbon, N.D.; 5. Tim Compson, Valley City, N.D. Feature – 1. Tim Schiek, Fargo, N.D.; 2. Torey Fischer, West Fargo, N.D.; 3. Nick Nelson, Georgetown, Minn.; 4. Kalvin Kesselberg, Ada, Minn.; 5. Eric Novacek, West Fargo, N.D. Feature – 1. Sean Johnson, Kindred, N.D.; 2. Dean Julsrud, Barnesville, Minn.; 3. Brandon Erickson; 4. Scott Richardson, Pelican Rapids, Minn.; 5. Mariah Henriksen, Glyndon, Minn.
WEST FARGO – Many race fans left Red River Valley Speedway after Thursday night’s ‘Dakota Cat 100’ event thinking Austin Arneson won the night’s 42-lap IMCA Modified feature. However, Arneson came up 25 pounds light at the scales, forcing an automatic disqualification. That handed the win over to Austin’s brother, Cale, who followed Austin to the checkered flag. That only fueled Austin’s drive to win even more on Friday night. With 12 laps in the books, it quickly became another battle between the Arneson brothers for the win as Cale led Austin. On lap 15, Austin got a run on Cale and stole the point before opening a sizable lead. With 23 laps to go, a caution reset the field, which allowed last Friday’s winner, Michael Greseth, to move into the runner-up spot. Greseth set his sights on the No. 10 of Arneson, but Arneson was too strong as he pulled away by four seconds in the closing laps. Arneson was unchallenged on the final lap as he took his second RRVS win of the season. Luke Johnson edged out Dan Dowling in the final laps of the IMCA Sport Mod feature. However, Johnson and Dowling were both disqualified following post-race inspection. That gave Jesse Skalicky his fourth RRVS win of 2017. Duffy Froemke held off Rick Schulz in a thrilling green-white-checkered finish during the IMCA stock car feature. 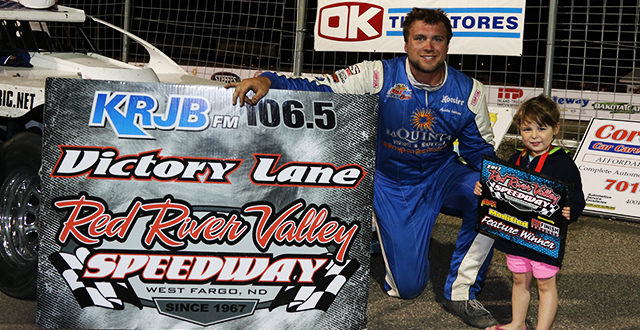 The win was Froemke’s second of the year at the West Fargo three-eighths mile dirt oval. Scotty Richardson picked up a popular win in the INEX Legends, while Tim Shiek was victorious in IMCA Hobby Stock action. WEST FARGO – Many race fans left Red River Valley Speedway Thursday night thinking Austin Arneson won the night’s 42 lap IMCA Modified feature. However, Arnesen came up 25 pounds light at the scales. That handed the win over to Austin’s brother, Cale, who followed Austin to the checkered flag. Last Friday’s winner, Michael Greseth of Harwood, jumped out to the early lead as the green flag waved on the Modified feature. Greseth looked to have the car to beat in the first handful of laps before he was forced to retire from the event prematurely with mechanical issues. That gave the lead to Johnny Scott. Once assuming the lead, the New Mexico driver checked out from the field and seemed to have the race in hand. With six laps remaining and a full straightaway lead over Austin Arneson, Scott also suffered a catastrophic failure as a broken j-bar forced him pitside. The night was dedicated to injured Fargo driver Mike Bruns, Sr., who traveled with Arneson as a crew member for several years. A benefit was held for Bruns during the intermission and Austin Arneson offered to add to that total by donating all of his winnings before knowing he would later be DQ’d. Chris VanMil backed up his win at Buffalo River Race Park’s season opener and claimed the IMCA Sport Mod feature race. .
Brandon Schmidt went back-to-back in the IMCA hobby stock as he visited KRJB Victory Lane in his No. 219 machine. Fifteen-year-old Tim Estenson, who flipped his INEX legend last Friday night, rebounded to score his fourth win of the season. Kelly Jacobson grabbed his first career IMCA stock car win by holding off Minot’s Scott Yale on the final lap. 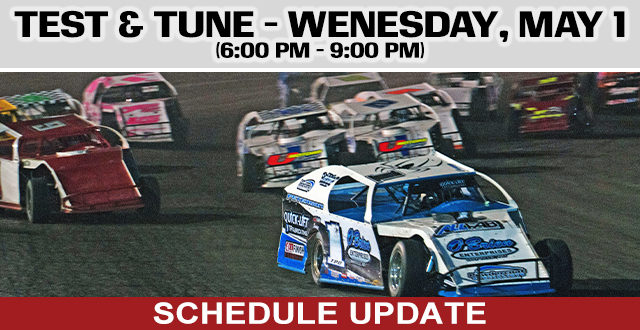 Racing continues Friday night at Red River Valley Speedway for the final night of the Dakota Cat 100. WEST FARGO – Red River Valley Speedway was back in action Friday night with a strong field of 85 race cars in attendance among the five racing division. Michael Greseth, Jesse Skalicky, Baiden Heskett, Aaron Olson, and Brandon Schmidt all visited KRJB 106.5FM Victory Lane. Harwood’s Michael Greseth picked up his first IMCA modified win of the season, despite starting outside of the fifth row. Greseth began moving forward at the drop of the green flag, picking off 10 cars in the first 10 laps. With 12 circuits remaining in the 20-lap feature, Greseth stole the lead away from pole sitter, Michael Johnson, at the flagstand. From there, Greseth built up a comfortable lead to take the victory over Dave Shipley and Tyler Peterson, who both started outside of the top 10. Johnson and Tyler Hall rounded out the top five. Jesse Skalicky’s phenomenal start to the 2017 season continued during the IMCA Sport Mod feature. The Fargo driver started mid-pack in the 11th position but quickly made his way through the field. Skalicky topped the top three on lap five, but Moorhead’s Luke Johnson held a comfortable lead up front. A caution with 10 to go gave Skalicky the break he needed as he started right on Johnson’s rear bumper for the restart. Skalicky was able to get by Johnson’s No. 8J machine, before checking out from the pack. Skalicky went on to record his third win of the season at RRVS to remain undefeated at the West Fargo dirt oval. Fargo’s Kelly Jacobson charged from 17th to finish second. Aaron Olson topped the field of IMCA stock cars with a late race pass on Duffy Froemke for the lead. After Froemke led the majority of the feature, a restart with six to go was the deciding factor. Olson stormed by Froemke with four laps to go to claim his third victory of the young 2017 season. Baiden Heskett picked up his first win in the INEX legends, while Brandon Schimdt found victory in the IMCA hobby stocks. Racing continues next Thursday and Friday night at Red River Valley Speedway with the running of the inaugural two-night Dakota Cat 100. Feature – 1. Michael Greseth, Harwood, N.D.; 2. Dave Shipley, Argusville, N.D.; 3. Tyler Peterson, Hickson, N.D.; 4. Michael Johnson, Moorhead, Minn.; 5. Tyler Hall, Fertile, Minn. Feature – 1. Jesse Skalicky, Fargo, N.D.; 2. Kelly Jacobson, Fargo, N.D.; 3. Taylor Grover, Shelly, Minn.; 4. Greg Larson, Kindred, N.D.; 5. Chriss VanMil, Barnesville, Minn. Feature – 1. Aaron Olson, Mekinock, N.D.; 2. Duffy Froemke, Lisbon, N.D.; 3. Rick Schulz, Horace, N.D.; 4. Eric Harpole, Bismarck, N.D.; 5. Kelly Jacobson, Fargo, N.D. Feature – 1.Brandon Schmidt, Hillsboro, Minn.; 2. Tim Church,; 3. Kasey Ussatis, Nome, N.D.; 4. Maranda Borg, Harwood, N.D.; 5. Torey Fischer, West Fargo, N.D. Feature – 1. Baiden Heskett, Shakopee, Minn.; 2. Josh Julsrud, Barnesville, Minn.; 3. Andrew Jochim, Glyndon, Minn.; 4. Kaitlyn Skalicky, Fargo, N.D.; 5. Brian Hanson, Jamestown, N.D.
WEST FARGO, N.D. (May 12, 2017) – Just as he did on opening night, Jesse Skalicky parked his IMCA Sportmod in KRJB 106.5FM Victory Lane for his second consecutive win at Red River Valley Speedway on Friday. The Fargo driver started back in the 18th position for the 18-lap Eide Bailly feature, but quickly found his way into the top ten by lap three. The defending RRVS Sportmod track champion cracked the top five on lap five before taking the lead with eight circuits remaining. Austin Arneson also went back-to-back at RRVS on Buffalo River Sales, Drainage Solutions & AM970 WDAY night, winning the All Finish Concrete Modified feature. Arneson wheeled his way to the front after starting back in the 11th position. Tyler Peterson came home second, followed by defending track champion, Rob VanMil, Michael Greseth, and Dave Shipley. Thursday night’s winner at Norman County Raceway, Luke Johnson, came from 11th to finish in the runner-up position as Chris VanMil rounded out the podium. Fifteen-year-old Fargo native, Tim Estenson, picked up the Petermann Seeds INEX legends feature win. Estenson held off defending track champion, Josh Julsrud, and Andrew Jochim for his first career win at RRVS. Duffy Froemke picked up the Audio Garage IMCA stock car win, while Cory Tammen found victory in the Fargo Force super stock feature. WEST FARGO, N.D. (May 5, 2017) – Racing returned to Red River Valley Speedway last Friday night with 99 cars checked in among five different divisions. 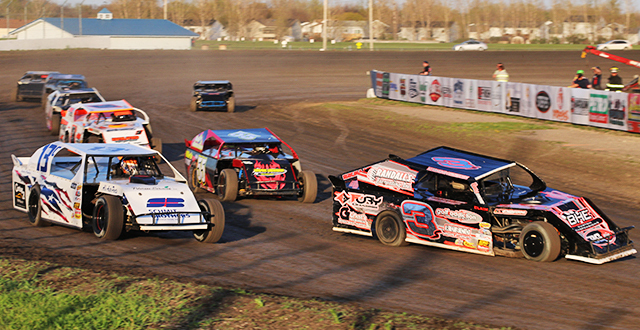 Warm temperatures and sunny skies helped bring in a huge crowd, who saw fantastic racing all night long on the semi-banked three-eighths mile dirt oval. Just as he did during last year’s season opener, Austin Arneson took the early lead of the All Finish Concrete IMCA Modified main event and never looked back. The Fargo driver pulled away from the 29-car field at the drop of the green flag before running off to an advantage of over a straightaway. Behind him, Billy Kendall and Mike Greseth were engaged in a fierce battle for the runner-up spot that intensified when they encountered lapped traffic. Kendall held off Greseth to take second position at the checkers, but that all took place nearly seven seconds behind the race winner Arneson. Dave Shipley and Austin brother, Cale Arneson, rounded out the top five. Veteran auto racing driver Corry VanMil scored Red River Valley Speedway’s (RRVS) first-ever Audio Garage IMCA Stock Car feature win. “This feels great,” said VanMil, who had to sit out the 2016 season due to health concerns. The Lake Park, Minn. driver started fourth on the starting grid but charged into the lead on the opening lap. From there VanMil drove away from the field as the pack fought for the runner-up position. VanMil went on to lead every lap in the main event, adding another historic win to his legendary RRVS résumé. Tim Church edged out Dana Brandt in a wild A Transmission City IMCA Hobby Stock finish. Church, the 2016 IMCA Hobby Stock national rookie of the year, led all 12 circuits and took the checkers 0.352 seconds ahead of Brandt. A pair of Shakopee, Minn. drivers led the field to the checkers during the Petermann Seeds INEX legends main event as Tim Brockhouse topped Baiden Heskett. FEATURE – 1. Austin Arneson, 2. Billy Kendall, 3. Mike Greseth, 4. Dave Shipley, 5. Cale Arneson, 6. Dev Malmlov, 7. Darren Pfau, 8. Michael Griffin, 9. Tyler Peterson, 10. Dale Kraling, 11. Rob VanMil, 12. Jarrett Carter, 13. Rich Pavlicek, 14. Cody Peterson, 15. Billy Vogel, 16. Tyler Hall, 17. Michael Johnson, 18. Ryan Restad, 19. Tailin Tommerdahl, 20. Brennan Bord, 21. Adam Fischer, 22. Karmith Christensen, 23. Tim Thomas, 24. Tom Cummings, 25. Terry Sahr, 26. Ed Conlin, 27. Jamie Schulz, 28. Trent Grager, 29. Nick Curtis. 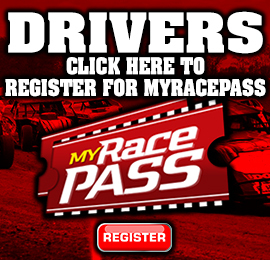 All drivers must also have sent in their competitor’s license application to their sanctioning body before their first race. 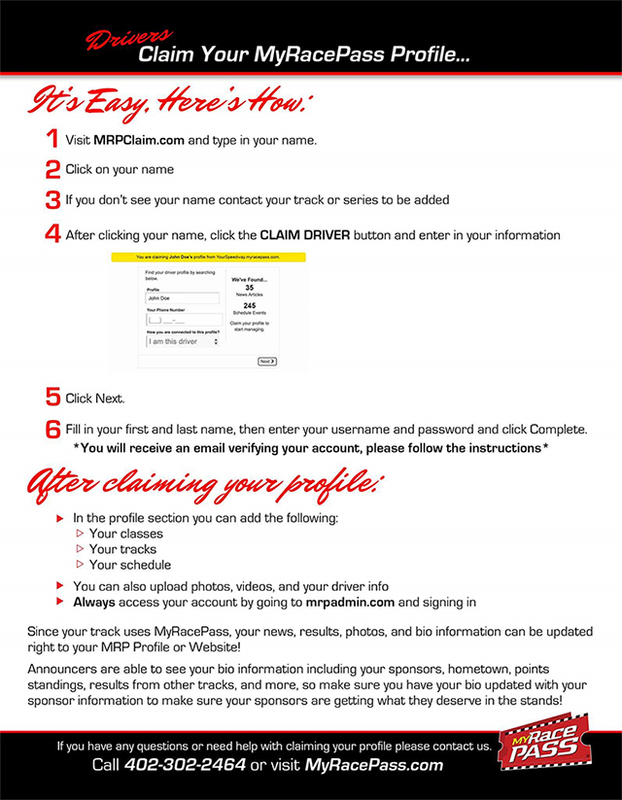 And drivers need to fill out a W9 and bring to the track for their first race.